I recently visited my favorite shopping spot, the Dollar Store. Gone were the shelves arrayed with all kinds of Christmas “stuff.” The familiar Christmas colors, gold, silver, green vanished. Gone was gold for the King of Kings, silver for the Lord of Lords, and green, the Hope of Jesse’s tree blooming with the birth of the Son of David. The only color that remained was red, the reddest red I ever did see! Of course, this color now proclaims not the red blood shed by the Lamb of God, so familiar to our liturgical eyes, rather the red which markets Valentine’s Day, inviting romantically inclined shoppers to festoon their homes and workplaces with hearts, cupids, fuzzy bears and, for the sweet-of-heart, chocolates and candies of every kind. Let’s not let the market reduce the heroes and heroines of our faith to colorful decorative trinkets. When we see red this month, let’s think about the red blood shed by the many martyrs this month remembers. Each of them died, shedding their blood in testimony to Jesus, the Lamb of God, who shed his blood for us! The Christian martyrs we honor this month include St. Blaise (Feb. 3), St. Agatha (Feb. 5), St. Paul Miki and Companions (Feb. 6), St. Valentine and SS. Cyril and Methodius (Feb. 14) and St. Polycarp (Feb. 23). Stories abound, factual and legendary, of how these lay men and lay women, consecrated virgins, religious priests, brothers and bishops shed first their self-centeredness and then their blood — unwilling to deny their identity as Christians. Indeed, the heart is an apt symbol for this month! Unlike the hearts decked with chubby little cupids shooting darts, the hearts of these men and women of the East (Cyril and Methodius, Paul Miki and Companions) and the West (Valentine, Blaise, Agatha, Polycarp) were of authentically Christ-like love. They died proclaiming their Christian identity, forgiving their persecutors and commending their lives into God’s hands. Although there is scant factual historical data about St. Blaise (316 AD) and St. Valentine (269 AD), their good deeds and cruel deaths live on in popular piety. Claudius, a Roman ruler, ordered Valentine beheaded because he presided at Christian marriages, a practice forbidden at the time. St. Blaise cured a child choking on a bone, on his way to prison and eventual death. The brothers St. Cyril (869 AD) and St. Methodius (884 AD), dubbed “Apostles of the Slavs” by St. John Paul II, died as victims of political intrigue for their brave and innovative efforts to evangelize the peoples of Northern Europe in their native language. An ancient saying, “The blood of the martyrs is the seed of the church,” reminds us that each one of us, the baptized, are entrusted with the mission to sow the seeds of the Gospel in every circumstance of our lives. We may not be tested as were these brave-hearted men and women; however, the true cost of authentic discipleship is not a single fantastic deed. It is the daily commitment “to put love where there is no love in order to find love (St. John of the Cross). So in this month of martyrs, who loved God unto death, let us ask them to pray for us when love is hard, when it costs us the cross of daily hardships we may face: the loneliness of aging, the pains of ill health, the distress of mental illness, the frustrations with family members or the stress of our work. Loving God through these hardships might not seem too romantic, so let’s revive the real story St. Valentine because his is our story, too. We may not shed our blood, but may our love for God, others and self be the heart of all that we say and do. 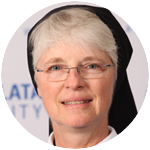 Sister Annette Pelletier I.H.M., Ph.D., is chair of the Theology/Philosophy Department at Immaculata University.